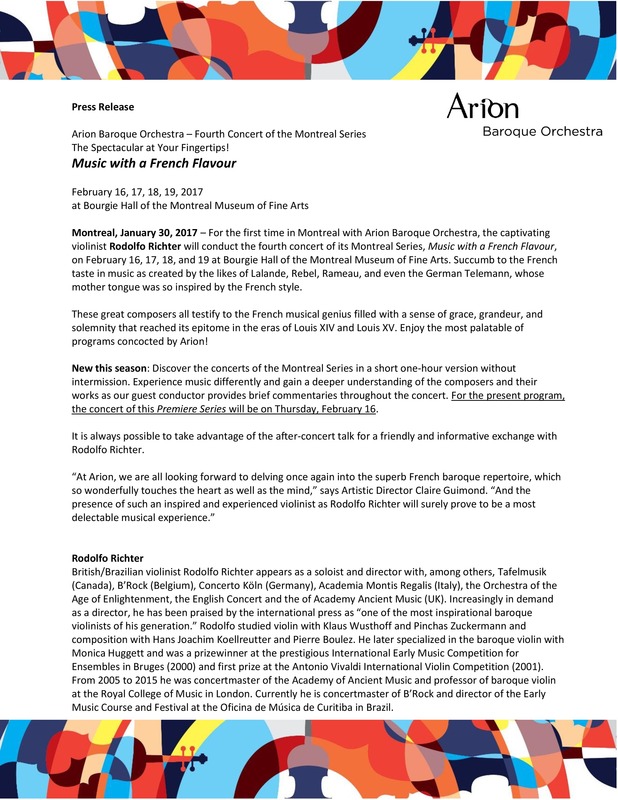 Montreal, January 30, 2017 – For the first time in Montreal with Arion Baroque Orchestra, the captivating violinist Rodolfo Richter will conduct the fourth concert of its Montreal Series, Music with a French Flavour, on February 16, 17, 18, and 19 at Bourgie Hall of the Montreal Museum of Fine Arts. Succumb to the French taste in music as created by the likes of Lalande, Rebel, Rameau, and even the German Telemann, whose mother tongue was so inspired by the French style. These great composers all testify to the French musical genius filled with a sense of grace, grandeur, and solemnity that reached its epitome in the eras of Louis XIV and Louis XV. Enjoy the most palatable of programs concocted by Arion! New this season: Discover the concerts of the Montreal Series in a short one-hour version without intermission. Experience music differently and gain a deeper understanding of the composers and their works as our guest conductor provides brief commentaries throughout the concert. For the present program, the concert of this Premiere Series will be on Thursday, February 16. It is always possible to take advantage of the after-concert talk for a friendly and informative exchange with Rodolfo Richter. British/Brazilian violinist Rodolfo Richter appears as a soloist and director with, among others, Tafelmusik (Canada), B’Rock (Belgium), Concerto Köln (Germany), Academia Montis Regalis (Italy), the Orchestra of the Age of Enlightenment, the English Concert and the of Academy Ancient Music (UK). Increasingly in demand as a director, he has been praised by the international press as “one of the most inspirational baroque violinists of his generation.” Rodolfo studied violin with Klaus Wusthoff and Pinchas Zuckermann and composition with Hans Joachim Koellreutter and Pierre Boulez. He later specialized in the baroque violin with Monica Huggett and was a prizewinner at the prestigious International Early Music Competition for Ensembles in Bruges (2000) and first prize at the Antonio Vivaldi International Violin Competition (2001). From 2005 to 2015 he was concertmaster of the Academy of Ancient Music and professor of baroque violin at the Royal College of Music in London. Currently he is concertmaster of B’Rock and director of the Early Music Course and Festival at the Oficina de Música de Curitiba in Brazil.